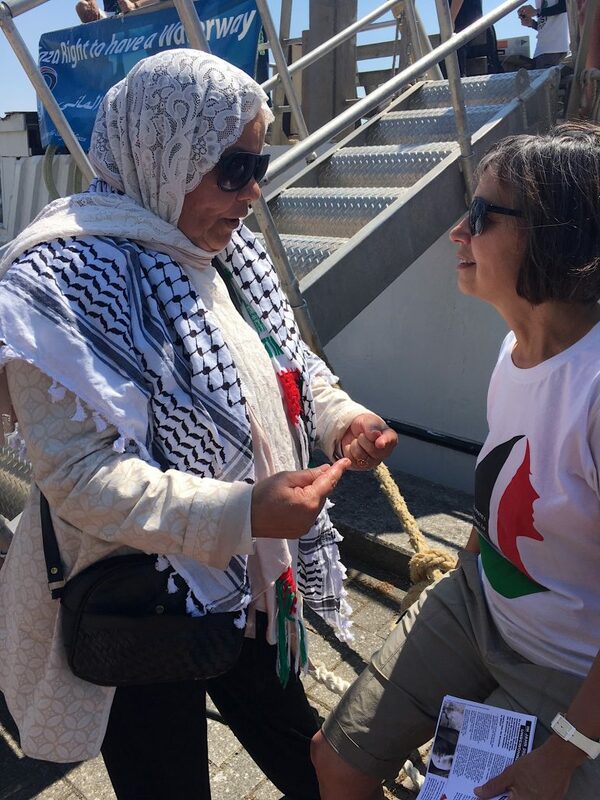 This is the second report from Elizabeth Murray who is aboard a new flotilla to protest the illegality of the 12-year blockade that is choking Gaza. We are possibly a more motley crew than the passengers aboard the S.S.Minnow in the old U.S. TV series Gilligan’s Island: Among those who have joined us on one or more legs of the journey to Gaza as part of the Freedom Flotilla Coalition (FFC) are activists hailing from Spain, Israel, Norway, Malaysia, Canada (First Nations), Denmark and the United States. 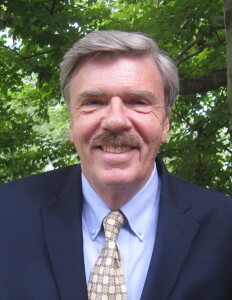 Despite our diverse ages and backgrounds we have some important things in common: minds that comprehend the crimes and human rights violations being committed daily against the people of the Israeli-occupied Palestinian territories; hearts that feel deeply the pain of those whose basic freedoms have been denied for 70 years; and consciences that want to find a nonviolent way to reach out to these people, right the wrongs of the Gaza blockade, and achieve a measure of justice. Political representatives have failed repeatedly through a lack of the political and moral courage to secure justice for a people facing 70 years of sustained, brutal subjugation by a foreign power, Israel. 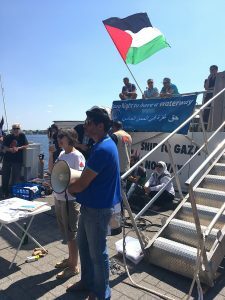 Thus the international Freedom Flotilla Coalition (FFC) sails again. Murray addressing crowd at Wilhelmshaven. This time the FFC will not attempt to deliver medical supplies or foodstuffs to the suffering people of Gaza. Past experience with previous FFC missions indicates that such materials will likely never end up in Gaza, or will arrive in spoiled or damaged condition. Instead, the Al-Awda will deliver itself – a refurbished Norwegian fishing boat – as a solidarity offering to the fisherman of Gaza. They are shot at and harassed on a daily basis, prevented from feeding their families, and have their fishing boats regularly seized and destroyed by Israel. There is so much misery in Gaza that could easily be alleviated since nearly all of it is either deliberately manufactured by Israel (such as the bombing of sewage plants, the electricity grid, Gaza harbor, the undrinkable water) or is an immediate by-product of Israeli policy (widespread post-traumatic stress disorder and associated mental illnesses, a spike in the rates of cancer, once extremely rare among Palestinians). The economic blockade, the restrictions on foodstuffs and construction materials, the travel bans, and the sealed borders are all aided and abetted by Egyptian leader Abdel Fattah al-Sisi, an ally of Israeli Prime Minister Benjamin Netanyahu. Under al-Sisi the Rafah border to Egypt – the only non-Israeli outlet available to the Palestinians of Gaza seeking medical aid or travel abroad – is almost always closed. These blatant violations of human rights and the Geneva Convention have occurred with the complicit wink of the U.S. and Europe, whose weapons manufacturers profit handsomely from their arms sales to Israel. 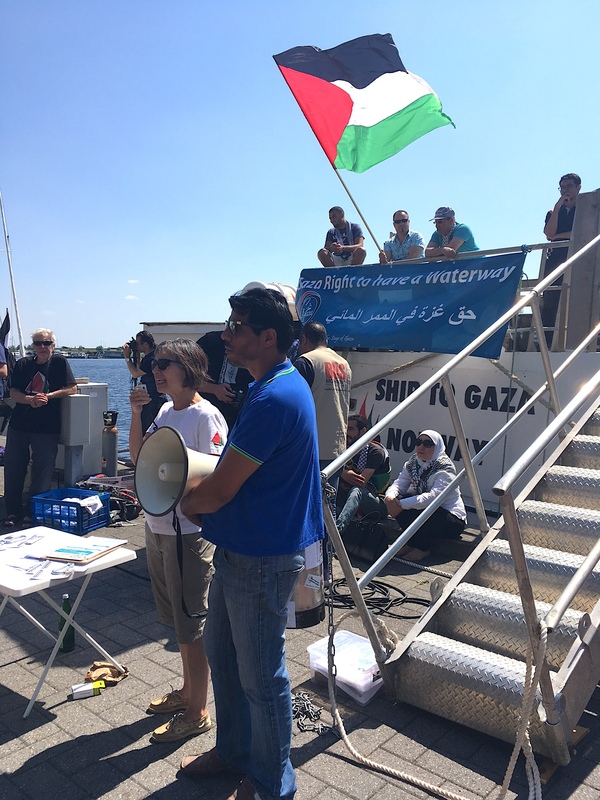 During our ports of call in Germany, visitors to Al-Awda told us that many German politicians as well as ordinary Germans are reluctant to speak out against human rights abuses against Palestinians because they say that if they do, they will be branded as anti-Semitic and possibly have their lives and careers ruined by this smear. Listening to these German citizens express their solidarity with the FFC mission in passionate, yet hushed tones, one cannot but think back to the suppression of free speech by the Communist-era East German government that was fiercely enforced by the secret police known as the Stasi. One can only deplore the practice of self-censorship that has become widespread in what is supposed to be a free and democratic, united Germany. It also underscores the powerful political pressure that Israel brings to bear on many European countries. Of course, Germany’s uniquely evil treatment of Jews historically makes it only natural that Germans would be reluctant to criticize Israel. Meanwhile, the Palestinian-German community in Wilhelmshaven showered us with gifts of home-made Palestinian delicacies and serenaded us with singing, dancing and playing of the oud, a classical Palestinian stringed instrument. They thanked us for making this journey, saying they only wish they could join us and return to their original homes and villages. Their love and affection for our mission is overwhelming. In Amsterdam we were feted by local peace and social justice activists who hosted a dinner of traditional Palestinian food. After a very rough night at sea en route to Amsterdam – during which the Al-Awda tossed and pitched amid enormous swells – we are grateful to be here in calm waters, enjoying the warm hospitality of the local human rights community. We aim to approach Gaza harbor unimpeded, so that our supporters there can receive us as well. What a contrast the bill certainly is when seeing the continued brutalizing and sufferong of Palestinians. People do not understand the difference between ZIONISM and Judaism. ZIONISM IS NOT JUDAISM Anti ZIONISM is not anti semitism’. This difference is critical to know. We are not criticizing Judaism at all, but rather Zionism that has an indigenous people trapped in an open air prison. Thank you for doing this. Such a beautiful show of love and compassion. The world will never know peace until the problem of ZIONISM is eradicated. I wish I could be aboard the flotilla. At 75, I have followed this international crime scene. When I lived in NYC there were marches nearly daily against Israel. I recall how many rabbis marched with us. This is a zionist problem. My heart goes out to all who live in the worlds largest prison, I condemn all politicans who stand with zionists not those of the Jewish faith. May your trip be fruitful! You are indeed brave people as are the Gazans challenging the might of Israel who hide behind their guns and tanks and propaganda. God is always with you and the decent people of this world. Ariel, you comment, which has merit, will be ridiculed if exposed to public scrutiny Critics will say, how can a small group of people run the United States. And Israel and its supporters don’t run our country but influence/run only that part where Israeli interests are involved. In other words, it only influences what it chooses to influence, which is substantial. There is no instance, with the possible exception of the Suez crisis over sixty years ago where America acted against Israeli interests. Well, there is the Jonathan Pollard case which is often cited but is trivial. Banking/Finance and the MSM are two huge areas where Zionists have disproportionate influence in the US, and to some extent globally as well. The right way to commemorate the holocaust is not by pampering Israel but by defending the rights of today’s oppressed people including the Palestinians, the Rohingya, the war refugees, and many others. Israel exploits the memory of the holocaust for its own gain while treading on the rights of the oppressed. I believe VIPS own Ann Wright is also a part of this flotilla. I went to see her slide presentation of past flotillas and conditions in GAZA in Northampton, Ma last month. Bless all the brave souls for their continued defiance in the face of Israel’s flagrant violations of international law. A great and informative article at should be published all over the world so that people wake up and do something to stop the terrible crimes committed by Israel on a daily basis against the Palestinian people with impunity. Why is people afraid of the Jews? To John Wilson in reply to his June 3, 2018 5:25 & 5:31 am. “Something is only illegal if . . . . . ” Great observation John. U R spot on Brother. 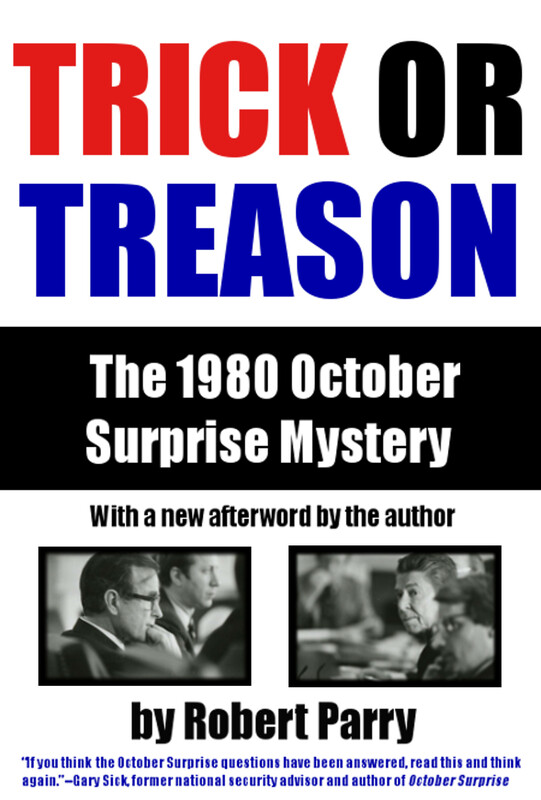 In the middle to late 60’s the CIA, the Olin Family and a fella named Thompson who ran a precision tubing company were caught helping CIA launder money and it has never stopped. SEE JAME MAYERS BOOK “DARK MONEY” ~ PAGE 104. Almost before WWII was over Robert Blum advocated that CIA be funded exclusively by trusts and foundations. He and Alan Dulles even managed to hijack CIA to facilitate their law breaking. Like the old saying goes “It’s only illegal in New Jersey if you get caught. He was part of the early cadre of deep state benefactors. One of those who thought laws were for others kind of like the current thing in the White House. Sam F has it right! And remember those who blindly follow corrupt, leadership urging the death of innocents are at least as guilty as the leadership. Something us Americans know quite a lot about. Currently in the U.S. the fake president has a loyal following of around 37% of the population. Nothing close to even a simple majority. So we know now what it takes to derail a country. A lying president and a corrupt administration. Mmm, sounds familiar. It may well be time for the remainder of the worlds political leaders take the reins of world policy making and turn out the old broken down horse that is America’s right wing party and set them out to pasture. And the democrats need to be turned into the same pasture. They only profess to oppose the right and never really have done so. There will be NO MAKING THINGS RIGHT until the U.S. can once again lead it’s self. But let me tell you the corruption of the government by the deep state will be no small thing to over come. First step prosecute all the felons at CIA!! Then audit all American billionaires and the ones who have there money off shore lose it. Let the Feds confiscate it like they do drug money. Oh wait it is all either drug money or the profits from laundering drug money. Should be noted that the reference to “open-air-prison” is a gross understatement of conditions there. No developed nation imposes these conditions on their prison populations. The destruction of sewage systems, as noted, has been deliberate. Few readers, however, realise that destruction of energy sources and restriction if fuel supplies for electricity generation, is also intended to disable desalination plants, needed for the potible water supply. The ground water in Gaza is unacceptably saline, and was already becoming progressively more saline from over-use, prior to the abandonment of Israeli settlements there. These are very brave people, knowing that Israel has already once committed murderous piracy to forestall a previous flotilla. it is not being reported in the MSM. Wonder why? The most perfect way to bring down Israel’s right wing madness would be to have the Jews themselves bring it down. Yossi Klein, wrote in Haartz how the Israeli Government uses the world’s Jews as a shield, a front, and Yossi relates to us his frustration with this dilemma. There is lots of discontent among the world’s Jewish population, and many Jews are not onboard with Israel’s brutal treatment of the Palestinian. Along with all of us supporting this humanitarian aid flotilla, we should elevate the words of such Jews as Yossi Klein who has had enough with this Zionist madness and calls out for fairness to replace the Nazi like treatment of the Palestinian. I think a good strategy for the flotilla would be to make sure they have plenty of video cameras and multiple satellite uplinks and redundant video storage capabilities so that the Israeli war crimes are well documented if they occur and hopefully get onto the internet in “real time”. It is their only hope to avoid being beaten or worse by the Zionist forces. Good idea; I hope that they have excellent coverage in real time. As a person who used to be willingly blind to this matter, I would love to say that anyone can wake up but as you say what we think makes Close to know difference on the other hand it does seem like US Empire and that of its 51st state of Israel are stretching beyond their natural limits and we are about to see a backlash, perhaps the American peoples opinion will may Sunday mean something again. I tend to be somewhat suspicious of articles that site Chomsky as he is the major liberal gatekeeper on all things that are really important on the other hand for the obvious injustices I suppose the more the merrier, as a person who is recently woke to the scale of the is really a aggression toward the Palestinian not to mention all the countries surrounding Israel, I just hope this does not turn into another USS Liberty incident. So good luck to the freedom flotilla and all that attend and keep those live feeds on, your lives depend on it! Very true. I think John Wilson actually agrees. International law is for small countries other than fascist Israel. Anti Semitic and anti Israel are two totally different things, as are anti Semitic and anti Zionist. The Israel government is Zionist and Facist and relies on the sentiments of the “holacoust” to implement it’s genocide of the Palestinians. No one that I know has anything but horror and abomination for what the Nazis did to the Jewish people. Similarly we have horror and abomination for what the Zionist Israeli regime has done to the Palestinians, particularly in Gaza, and the parallel off dishonouring the israeli Jewish population in front of most of the world. This is true and I not only worry about the backlash toward Israel, I worry about the backlash toward the United States as we have been doing similar things for the last hundred years or so. “follows no laws, Ariel ? What laws are you referring to, surely not the long since defunct so called international law which has been dead and buried for years? Jeff, you are quite deluded. There is no international law because the supposed law that there is, is ignored. Law only works when all parties are in accord with its provisions and statutes. Once certain parties are allowed to run completely roughshod over the law, which is the case at the moment and has been for many years, then the law is in disrepute and to all intents and purposes, VOID. Something is only illegal if there is a recognized authority to enforce any law in this regard. There is no such authority so its not illegal. I think you need a lesson in the law and a reminder about something called morals. He is commenting sarcastically on the lack of enforcement of international law, not justifying it. and seven countries in five years aka the yinon plan is intended to spread that lawless area/failed states as far as eretz israel can hope for. israel laughs at its u.s. prostitute. 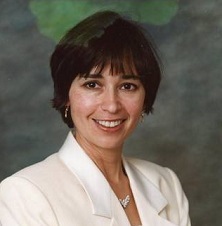 Best wishes to Elizabeth Murray and the Freedom Flotilla, may they reach Gaza unimpeded! Perhaps with a US intelligence officer aboard, and no medical supplies, they have a chance. I suggest consulting Russia, Spain, or Turkey to arrange enforcement of international law by escorting them. With Russia’s Latakia port in Syria protected, they should really open up Gaza and damn the US and Israel. This would be an historic foreign policy coup for any nation capable of nuclear standoff with Israel! Russia has a sufficient Mediterranean fleet and could start with this simple gesture to start diplomacy. Alas, no other country on the planet has the fortitude to mess with Israel in any way, not even the mighty United States of America, if it were so inclined. How else to account, using only a few examples, for repeated American roll-overs to the Jewish state in the cases of i) the USS Liberty, ii) layers of American officials looking the other way while the Israelis purloined enriched uranium and technology from this country to create a nuclear arsenal, iii) the billions in American tax revenues poured into Israel every year while our own people go without critical services and infrastructure, iv) repeated acts of genocide by American forces throughout the Middle East, especially in Iraq, Syria, Lebanon and Palestine, to abet Israeli occupation and forced colonisation of Arab lands, and v) most recently, passage of a bill in congress, and now a law after being signed by the president, gouging the Polish state, under penalty of international sanctions, for an estimated $600 billion in reparations for purported loss of Jewish property during World War II, said money payable basically to the Jewish-American Lobby, which by now must have resources exceeding those of the Pentagon after similar fleecings of Germany, Switzerland and other European countries. Read an account* of the latter by Israel Shamir to learn how shocking the “remedies” and consequences to international law will be, especially under the impetus given them by more knee-jerk support of Israeli demands by Washington. Uncle Sam could not be more generous to his Chosen People with the land and treasure of other nations. Are you certain that it is $300 billion? Magnitude wise, that would be about 45% of the US military budget. Or the per capita tax contribution to Israel about $920. Knowing that the working age is about 40% of population, the actual per tax payer contribution would be close to $2,300 per year. Realist, Thanks for the link to the VERY informative and interesting article by Israel Shamir. If the Jewish organizations can reclaim property lost by Jews in WWII, and to such unusual and extreme degrees, Palestinian organizations certainly can reclaim the property they had stolen by the Zionists after WWII. Sometimes a “trope” can be true, and needs to be faced squarely. Accepting stolen goods is also a crime. Actually many Jews are good people. Like all tribal movements, zionism has members who believe in the great cause, other members who profit from it as a business, and soon was led by tyrants who made it a theft racket. They considered other locations for a homeland before WWII and chose Palestine to recreate an historical empire for their fundamentalists. So daily we see the professions of good intentions from fundamentalists and nationalists of all kinds who in fact have no principles at all, to rationalize acts of pure self-interest. Yes, Jews stole the Palestinian land in various ways, including assassinations and terrorism from the 1930s to serve their mass migrations there. Britain had a “mandate” there not locally agreed, wanted to give it up due to zionist violence, and dumped it after WWII. Truman twisted arms at the newly-formed UN to create Israel, as a result of zionist campaign bribes. It was indeed stolen. Were an invading force to rout your community from your homes killing those who might deign to defend themselves or even protest, while shipping the rest to some remote area would you not consider that (among so much more), theft? And this, despite the fact that if a US citizen, you are not likely indigenous to that country. I imagine that Russia has the fortitude; the question is whether liberating Gaza fits their foreign policy goals and schedule. It would guarantee far less opposition from Muslim groups, one of their major security concerns, and would help unify the world against the corrupt and anti-democratic US government. It’s not that the US doesn’t have the “fortitude” do deal with Israel. The US doesn’t want to. The US wants to maintain Israel as a thorn in the flesh of the Arabs to maintain the region in a constant state of war. Divide and rule, that’s the only way the Empire can impose its dictate on the rest of us. 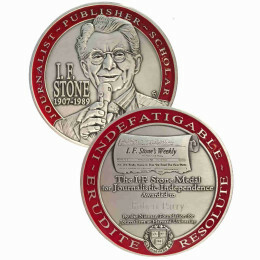 I said, “if it were so inclined.” Clearly it is not inclined to buck Israel in the least. It doesn’t facilitate Israel’s every whim and outrageous misdeed without a purpose in mind. People here have invariably noted, and I certainly don’t disagree with them, that Washington has made Israel’s agenda its own agenda because of the powerful presence of Jewish neocons throughout American government, banking, finance, industry and media. All the problem areas I itemized were entirely deliberate and not mere acts of omission. They are the acts of insiders using American power strictly to benefit Israel at great expense to America. Watching the disgraceful, tiresome performance & diatribe by US Ambassador Nicky Haley at the U.N. emergency meeting over the Palestinian situation, really sums up the problem here? And the problem is, the greatest Rogue nation & supporter & instigator of Terrorism on Earth, called America, supporting it’s little vassal Rogue nation called Israel? Two immoral Nations that operate by their own agendas & think that they are above International laws? Why doesn’t the US & Israel just leave the U.N. organisation as both Countries are a joke, as they never abide by any International laws or agreements unless those laws can be warped to serve their own interests? The hypocrisy of the American Govt who illegally bombed Syria based on faked intell “to save the “little Syrian children” from the so called Animal Assad, yet can pick & choose & not apply the same logic to save the Palestinian people or their children from being murdered by the IDF? This Palestinian attempt to to break the Naval blockade is a desperate attempt to highlight Israel’s illegal, state sanctioned confiscated land grabs & murder of Palestinians armed with nothing more than burning tires & stone slings, by drawing attention to their plight?? How many more Palestinian people must die before the World takes notice & stops this nonsense? ?